The Kentucky Termination Lease Letter Form is a state required correspondence that applies to a lessor or lessee who wishes to terminate a Month-to-Month lease. Generally, it is a good idea to maintain positive relations even when terminating a lease. This tends to reflect well on either party and may potentially add to one’s reputation. This show of consideration from a party departing such an arrangement may help prevent the remaining party from undergoing overwhelming hardships in needing to find a replacement. That is, a tenant is more likely to find a suitable replacement for the premises they reside in if they have the time to do so rather than only a few days. Kentucky State Law seeks to prevent such occurrences in KRS Chapter 33. § 383.695 – Requires both landlords and tenants to provide at least thirty (30) days’ notice before terminating a lease contract. It is imperative the user of this form letter allow enough time for delivery for the receiver to be in possession of the completed letter at least one full month before the termination date. The method of delivery must comply with any method for notice delivery described in the lease. If possible it is generally a good idea to send it registered or certified mail as this will require a signature and date from the receiver as verification of receipt. Step 1 – Check the first box then enter the calendar day, month, and year of the lease being terminated. Next enter the day, month, and year of the termination date. This is the only box to check. Do not check or fill in the second paragraph of this document. Step 2 – Sign and print your name in the spaces provided at the bottom of this letter. Step 1 – Skip the first paragraph. Place a checkmark in the box next to the second paragraph (beginning with the words “I am your Tenant”). 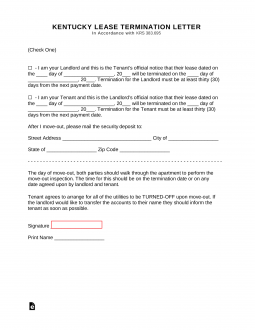 Step 2 – In the second paragraph enter the date of the lease you wish to terminate. Then enter the termination date. Step 3 – Report the address you wish your security deposit to be mailed to by entering the Street Address, City, State, and Zip Code. Step 4 – Sign and print your name at the bottom of this page.